Welders, cutters, solderers, and brazers must have a steady hand to hold a torch in one place. Workers must also have good hand-eye coordination. They often must lift heavy pieces of metal and move welding or cutting equipment, and sometimes bend, stoop, or reach while working. The ability to see details and characteristics of the joint and detect changes in molten metal flows requires good eyesight and attention to detail. This fall, Cleveland State will offer a certificate degree for our new Welding program. Welding is a much sought after skill set that offers a salary that is far above the average starting pay for this area, and the great news is that it only takes 9 months to get a certificate. If you think you want to be a welder, or you need to brush up or acquire new skills, Cleveland State offers a variety of non-credit welding classes to assist you in achieving those goals. Cleveland State Community College is now offering a Welding Technician Certificate* in conjunction with completion of these 3 Welding Courses & additional Technology Coursework. The majority of these classes are embedded in the Electro-Mechanical Associate of Applied Science Degree (A.A.S). Courses will consist of content from NCCER, OSHA, NFPA, and AWS standards. The basic skills of welding are similar across industries, so welders have the flexibility to shift from one industry to another. 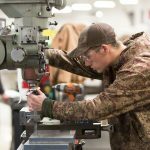 TCAT has little difficulty finding work for properly skilled welders. Acquire the skills necessary to perform welding processes such as TIG and MIG, which are commonly used in the industry. Instruction will be given in related math, blueprint theory, physical properties of metal, effects of heat shrinkage, basic joint designs, and fabrication. Practical work experience will prepare the student in the safe use of welding equipment on Mild Carbon Steel, Stainless Steel, and Aluminum. Training emphasizes the four basic positions of welding: flat, horizontal, vertical, and overhead.